On the contrary, when we sign with pre-verbal children we give them critical experience with language. In order to communicate, children must learn how to use abstract linguistic symbols, and both words and signs fall into this category. Although a one year old will not likely have a large enough spoken vocabulary to begin forming short sentences, many one year old signers possess a deeper, earlier understanding of how language is constructed and used, which is evidenced by their use of multiple signs to form short sentences. 3. How young is too young to start signing with my baby? No baby is too young to begin signing with! You can begin introducing signs as soon after birth as you feel comfortable. Be aware, however, that very few babies will sign back to their parents before 6 or 7 months of age. By signing early with your baby, you will begin to become more comfortable signing and your baby will be learning the information the signs provide at a younger age. Five months is usually a good age to begin bringing your baby to Signing Smart classes. By then, most babies are sitting independently and starting to pay attention to activity around them. They are more able to grasp the information available in class than younger babies and can begin to see the value in signing back. 4. Is it too late to start signing with my baby if he is 12/18/24 months? Absolutely not! While a 12 month old baby may have a few words, his vocabulary is still quite limited and his enunciation will probably be unclear. That said, one year olds are ready and willing to communicate their needs and interests. By offering them to a chance to expand their vocabulary through signing, you will save both your child and yourself a lot of frustration and you will also give your baby the chance to start claiming his independence in a meaningful way. Eighteen to twenty-four month olds who have begun talking will discover a whole new world through signing. 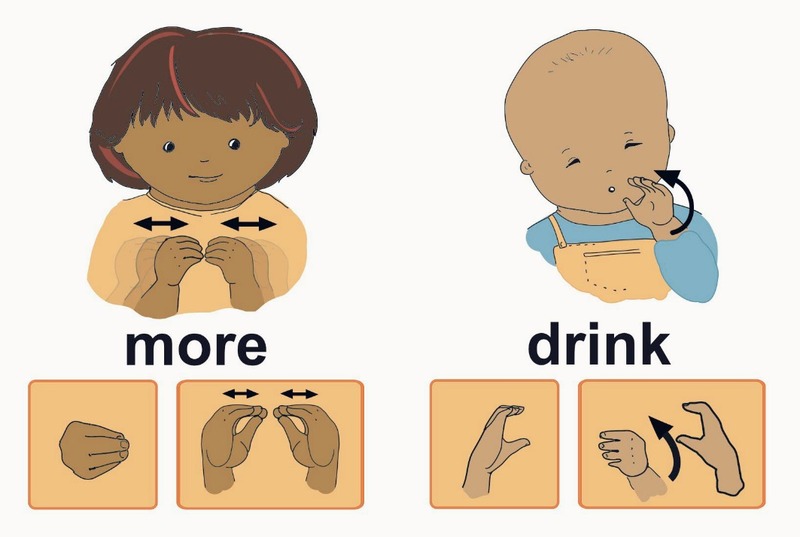 Children in this age range are primed for communication and can quickly learn and begin using signs to supplement their still limited spoken vocabulary. This in turn opens up many opportunities for concept development, vocabulary development, and overall long-term learning. Although the average number of spoken words for non-signing 18 month olds is 10-50, many Signing Smart toddlers have well over 100 signs by that age, along with a similar and growing spoken vocabulary. 5. We are already speaking one (or more) foreign language(s) at home, is it too much to sign with her too? By signing with your bilingual baby, you will help her process the languages she’s learning separately. Rather than confusing her, signs will act as a bridge between the two languages. For example, if Dad says, “Do you see the LIGHT?” and Mom says, “Mira la LUZ?” and both parents sign as they say their phrases, the child quickly connects the sign to the word (“light/luz”), and connects the words in the two spoken languages. The slight speech delay on the part of many non-signing bilingual babies (in comparison to their monolingual peers) seems to be due to their need to “separate out” the two languages. Signing Smart bilingual babies appear to develop spoken language as quickly as non-bilingual signers. 6. We’ve just taken the ten week Signing Smart Beginner class… what do we do now? Most Signing Smart students repeat the Beginner class at least once, depending on the age their baby was during the first class. The number of ASL signs learned (over 150!) and the developmental information covered in class become more accessible with repetition, for both babies and parents. Also, since sessions are ten weeks long, there is normally a three to four month gap between the start of sessions. This gap accounts for a huge span of time in your child’s short life, and he or she will be a completely “different” little person when you repeat the class; interests will have changed and their ability and need to communicate will have evolved dramatically as well. 7. We took the Beginner class, and now my baby has a handful of signs and is starting to talk. Why should I take the Talking Toddlers class? The Signing Smart Talking Toddlers class is really just that: a class for older signing children (15-24 months) who are beginning to talk or are already talking. The toddlers in Talking Toddlers often experience an “explosion” of spoken language skills, and you, the parent, will learn a host of fun ways to support their long-term learning, concept development, and comprehension. The Talking Toddlers class delves into more abstract concepts than the Beginner class, and so many of the things that fill our toddlers’ worlds are covered: vehicles, places, people, emotions, and colors, for example. Parents in the Toddler class learn how to keep up with their children’s exploding vocabularies, using both signs and words, as well as how to maximize their comprehension of the abstract concepts we learn—after all, it’s pretty hard to talk about “a blue”, or to remember how to appropriately label these oh-so-powerful emotions they’re feeling! The children in the Talking Toddlers class are all so engaged and interactive—with each other, the other parents in the room, and with me! So obviously enjoying the opportunity to grow, to learn and to communicate! This entry was posted in FAQ, language development, signing with toddlers, signing with your baby and tagged baby sign, baby sign language, language development, rina coury, signing child, signing smart, signing with toddlers. Bookmark the permalink.